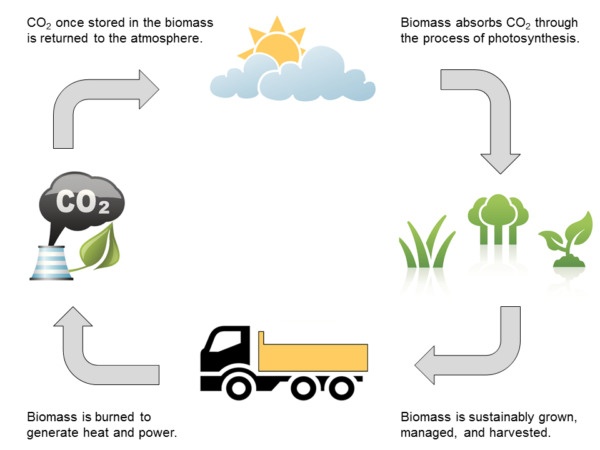 Biomass is a low-carbon fuel or energy source that comes from plant material such as wood, corn, sugar cane and grasses such as Giant King Grass. Biomass can be burned to generate electricity and heat, digested to produce biomethane, and converted into liquid biofuels, biochemicals and bioplastics. Biomass includes wood and food crops such as sugarcane and corn, and also byproducts such as agricultural waste-for example, corn straw (stover) and rice husks-and food waste such as vegetable oil recycled from cooking processes. Since biomass comes primarily from plants and vegetation that naturally re-grows, biomass is a renewable resource. Hydroelectricity and geothermal are two other renewable options to produce electricity. They will not be discussed here. Fossil fuels (coal, oil and natural gas) have played and continue to play a major role in transforming the world from an agricultural society to the modern industrial world we live in today. Fossil fuels produce electricity, and fuels for heating and transportation. They also provide petrochemicals used in industrial products and plastics. Advantages of fossil fuels are that they have been abundant and low cost, and that they provide reliable 24/7 electricity, heating and cooling, and transportation fuels. Disadvantages of fossil fuels are that there is a limited supply, and there are environmental issues in removing fossil fuels from the ground, transporting them and burning them in power plants or engines. In addition to pollutants like ozone, hydrocarbons, sulfur, mercury, smoke and ash, use of fossil fuels emits large amounts of carbon dioxide into the atmosphere. Furthermore, some fossil fuels are found in unfriendly countries or in unfriendly environments like under the sea. There are political, economic and environmental issues in obtaining these fossil fuels. Fossil fuels release carbon dioxide into the atmosphere. Coal has the approximate chemical formula CH. When coal is burned, the hydrogen is converted to water and the carbon to carbon dioxide. Energy is obtained from both the hydrogen and the carbon, and one carbon dioxide (CO2) is emitted into the atmosphere. Oil has the approximate formula CH2. Burning oil releases energy from both hydrogen atoms and from the carbon atom, and still one carbon dioxide is emitted. More energy is released per carbon dioxide emitted compared to coal. Natural gas is mainly methane which has the exact chemical formula CH4. Burning methane releases energy from the four hydrogen atoms and from the carbon, but still only emits one carbon dioxide. Natural gas is the best fossil fuel in terms of energy output per unit carbon dioxide emitted. Biomass is renewable because a new crop can be grown after each harvest, and biomass is a low carbon fuel. Biomass has the approximate chemical formula CHO. It is similar to coal with an oxygen atom added. The oxygen reduces the energy of biomass compared to coal, because the carbon is “half burned” and that energy is not available. When biomass is burned, energy is obtained from the hydrogen atom and some energy from the further burning of CO (but this is less energy than produced when burning coal) and one carbon dioxide is emitted into the atmosphere. At this level of thinking, biomass is a worse fuel than coal in terms of carbon dioxide emissions per unit of energy produced. The reason that biomass is a low carbon fuel is because biomass breathes carbon dioxide (extracted from the atmosphere) and stores it in its tissue. Yes, when biomass is burned, it emits carbon dioxide into the atmosphere. However, when it regrows, it absorbs exactly the same amount of carbon dioxide in the process of photosynthesis, and this cycle is carbon neutral. The carbon cycle is shown in the figure below. The carbon dioxide in burning biomass is emitted very quickly, but only reabsorbed over the growth period of the biomass. The timescale of biomass carbon neutrality can be 20 or 30 years in the case of some trees. A significant advantage of Giant King Grass is that it is very fast growing and can be harvested every six months or less. This is called a short rotation crop and the carbon dioxide emitted is reabsorbed very quickly. In practice, some fossil fuels may be used in the vehicles that harvest and transport the biomass, and to make the fertilizer needed for sustainable agriculture to prevent the soil from becoming depleted. These secondary uses of fossil fuels in the production of biomass have been well examined, and they contribute only a small amount of carbon dioxide compared to producing the same amount of energy with fossil fuels. Although biomass is often said to be zero carbon, it is more accurate to say it is a very low carbon fuel. 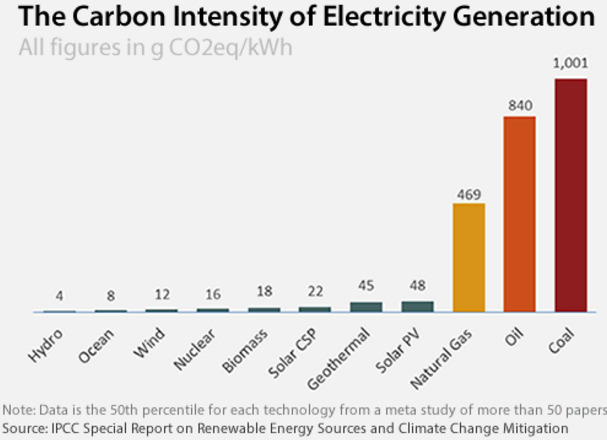 The amount of carbon dioxide equivalent produced by generating electricity with different technologies is shown in the figure below. The small amounts of carbon dioxide shown for solar and wind include the fossil fuels used to produce, install and maintain the equipment. Note that fossil fuel plants in industrialized countries are huge, producing 500 MW of electricity or more. A large biomass plant is 35 MW. A biogas plant could be 1 MW. In industrialized countries, biomass can be a small, but important niche player. In a developing country or in a remote location a power plant of 1 to 35 MW may be all that is needed and biomass can play a much more important role. In the UK, several coal-fired power plants are being converted to wood pellets and these are large-size. Solar and wind are two largest sources of renewable electricity. The major advantage of both solar and wind is that the source of energy is free. Furthermore operations and maintenance costs are modest, and the cost of the capital investment has come down dramatically. The total cost of solar and wind electricity is mostly paying off the capital investment. The major disadvantages of solar and wind are that they are variable and intermittent sources of energy. The amount of electricity produced varies by the season and fluctuates minute to minute. Some of the variability is removed by combining the output of many solar and wind farms located in different areas. Even with combining the output of more than 5000 wind turbines, the figure below shows that wind is still extremely variable. Combined output of all the 5000+ wind turbines feeding the grid in the UK March 2014. In addition to the hourly fluctuations, this figure shows that the average output of all the wind farms in the UK was 32.4% of the rated capacity. A wind turbine that can produce 5 MW when the wind is blowing at maximum speed, only produces on average 1.62 MW because the wind doesn’t blow at maximum speed very often. Solar energy depends on the amount of sunlight. The rising and setting of the sun is predictable, but clouds can dramatically affect the output of a solar farm. The figure below showing electrical output from a small fixed array solar facility in sunny Arizona illustrates the problem. 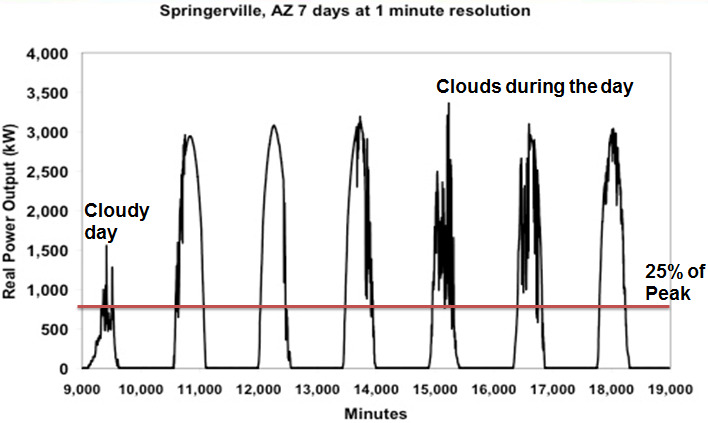 Output of solar facility in Arizona over seven days. The third day is an almost cloudless day and shows the optimum output from a fixed solar array. There is no solar output after sundown and the curves show small electrical production at sunrise, going to a maximum at noon and then falling again until sunset. This is predictable day-to-day, but the presence of clouds can change the output hour by hour. The effect of clouds can be reduced somewhat by combining the output of many solar farms, but is not eliminated. Furthermore the amount of sunlight is seasonal-- lowest in winter and highest in summer. Combined output of many solar farms showing daily and seasonal variations. The figures above clearly show the inherent problems with the variability, intermittency and seasonality of wind and solar electricity. The electricity customer wants reliable steady power. 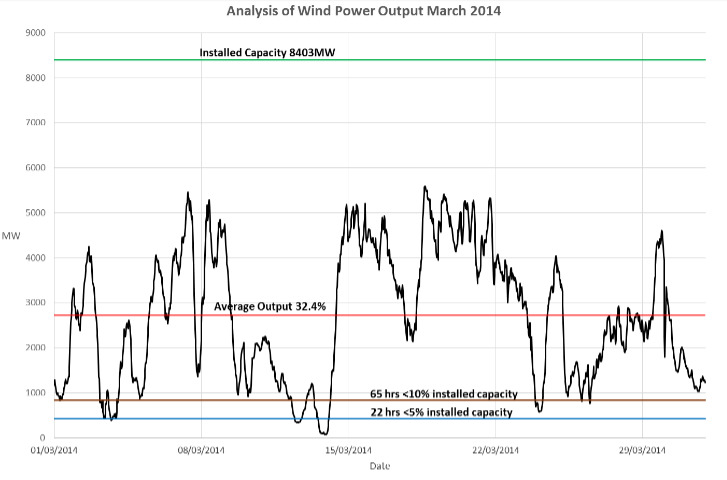 Wind and solar themselves do not provide steady power. One solution is to have a fast reacting backup power plant that can produce more electricity when the wind is not blowing and then can be quickly scaled back when the wind increases. The same concept applies to solar. The only fast reacting power plants available today use natural gas or oil in a reciprocating engine. Think of your car engine. When the wind is blowing hard or at noon for a solar plant, you let up on the gas and idle. When the wind slows down, you press the accelerator to produce more electricity, so that the combined output of the renewable source and the fossil fuel generator is a constant. This is illustrated in the figure below. 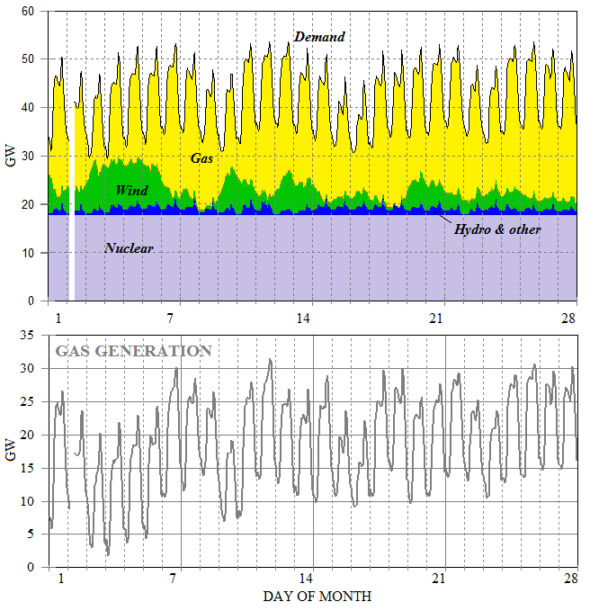 Example scenario of large amount of natural gas generation needed to be added to base electricity (shown as nuclear in this case), wind and other renewables to smooth out fluctuations and meet the daily demand. The figure above illustrates the issues with managing the grid to meet demand. Demand varies minute to minute and by time of day. Usually demand is higher in the daytime and early evening, and lower at night, and higher during the workweek and lower during the weekend. Grid operators need to have a combination of steady base power that is always on and resources that can be turned on for a portion of the day, and fast reacting power to provide the minute by minute demand. Before solar and wind, grid operators only had to deal with variable demand. With wind and solar, the sources are variable as well as demand. This makes the control issues more complicated, but are still manageable. Since the grid already had some fast reacting capability to handle variations in demand, inserting small amounts of variable solar and wind into the grid could be handled without adding new backup capability or affecting the grid substantially. Large amounts of fluctuating solar and wind electricity present challenges to grid operators and require investment in new backup systems and updating the grid. Obviously, if one could store the electricity, the problems with hourly and daily fluctuations would be eliminated. Batteries are well developed for small devices like mobile phones and laptops. There are many efforts ongoing worldwide to develop large utility scale batteries and other electricity storage solutions, and a few options are becoming commercially available. One of the largest battery systems is on Kauai, one of the Hawaiian Islands, where there is a 13 MW solar farm and 52 MWh of battery storage. The rated 13 MW solar farm produces on average 25% of this which equals 78 MWh in a day. The battery storage is sufficient to store enough energy for overnight. Battery storage currently is more expensive than the solar farm itself. The very high price of electricity in Hawaii allows this to be an acceptable option. BIOMASS POWER PLANTS, described in the “Green Applications” drop-down menu, typically range from 1 to 35 MW and produce steady, reliable, base power. These power plants do not respond quickly and operate most efficiently at 100% power. Biomass power plants can replace coal which is also provides base electricity, and can replace oil-fueled power plants used for base electricity in many countries and remote areas and in Hawaii. Biomass power plants can use direct combustion with steam turbines,or use anaerobic digestion to produce biogas which fuels a reciprocating engine. Both approaches produce mechanical power which turns a generator to produce electricity. One significant advantage of the anaerobic digester is that although it produces biogas at a steady rate, the biogas can be stored in an external gas holder (like natural gas is stored) and can be used as a quick responding source to meet peak demand or provide backup for wind or solar for a completely renewable and low carbon electricity source. This solution is only available in modest sizes up to five or ten MW. Biomass electricity offers a realistic and sustainable alternative to fossil fuels. Biomass electricity provides steady, reliable base power like fossil fuels. Biomass electricity complements solar and wind which provide fluctuating electricity and require fast reacting backup power to compensate for their fluctuations. Today, biomass electricity is generated using agricultural and forestry waste such as wood pellets from sawdust and wood bark, sugarcane bagasse which is the left over after the juice is squeezed out, corn stover, wheat straw, and rice husk. Future liquid biofuels and biochemicals are also targeting agricultural waste as a feedstock. Wood waste has other competing high value uses including construction materials and furniture made from pressed wood products. Forestry waste also depends on the business cycle. The amount of sawdust and wood scraps available is greater during the time of robust home-building, and declines significantly bring economic turndowns. Agricultural waste is seasonal and is not available until the food crop or cotton crop is harvested. At harvest, there is an abundance of waste, but this must be gathered, dried and stored until the next crop is harvested. In different seasons, wastes from different crops become available and there is no consistency of the fuel or feedstock. Reliability of supply is uncertain. A farmer may decide from year-to-year what to grow and the waste from the new crop may not be suitable for the biomass application. Agricultural waste is now expensive. Although the waste originally had little value to the farmer and was often burned or plowed under, prices have risen dramatically once the demand has developed. The agricultural waste market is largely a spot market with short-term pricing, and very few long-term contracts have ever been signed. It is difficult to get biomass project financing without an assured source of fuel or feedstock at a known price. Agricultural waste must be collected over a substantial radius-- say 50 km-- and this presents logistic problems and fossil fuels are expended during the collection. Because of these issues, many biomass power plants in India, for example, are running at partial capacity because biomass is not available or closed down because the fuel is too expensive to operate profitably. Europe has mandated that coal-fired power plants reduce their carbon emissions and many are replacing some or all of the coal by wood pellets. To assure that their power plants have a steady supply of biomass, European power companies have established their own wood pellet mills in the US, near the source of the wood waste. The long-term success of a biomass energy facility depends on having a secure long-term source of the biomass. The biomass industry has recognized that dedicated energy crops are an attractive option as fuel or feedstock for their plants-- either as the primary source or in addition to agricultural and forestry waste. 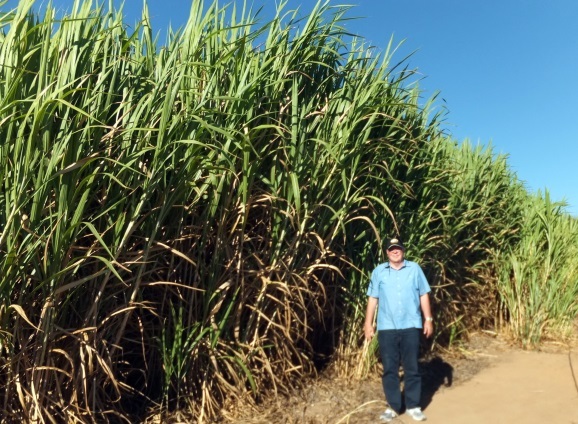 These dedicated energy crops can be perennial grasses such as Giant King Grass, fast-growing, short rotation trees similar to those being used in the pulp and paper industry, and potentially other plants. Among the different types of dedicated energy crops, non-food perennial grasses are practical and effective for producing green energy. Therefore, cultivation of non-food grasses does not compete with food or food-related crops such as corn; nor does it interfere or compete with valuable natural resources such as forests and other timberland. 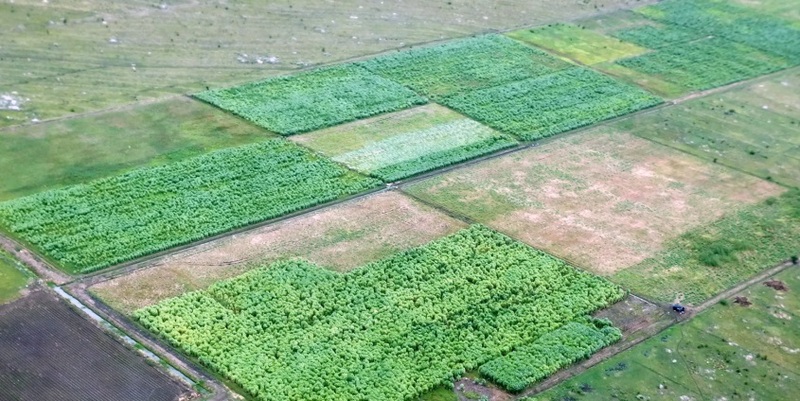 The use of food crops for bio-fuels is being discouraged or banned in many countries worldwide. VIASPACE Giant King Grass is the highest yielding biomass crop in the world. Highest yield means lowest cost. Giant King Grass can be used to generate electricity, biogas or as a feedstock for liquid fuels, biochemicals and bioplastics. When cut every 40 to 60 days, Giant King Grass is also excellent animal feed.